With Father’s Day around the corner, many people are in search of the perfect gift. However, shopping for an elderly father can be a challenging task. By this time in their lives, many men have already acquired the material items they want. However, there are some unique ideas to make the holiday memorable for your elderly dad. There are many different types of upgrades you can give your father to increase his safety in the home environment. Consider bath or shower grab bars, a handheld shower head, or lever-styled doorknobs. Nightlights or LED light strips increase visibility during the night. More expensive options might include ramps leading to the front or back door. A professional caregiver can also help your loved one age in the comfort of home. If your senior loved one has been diagnosed with a serious condition and needs help with tasks like meal prep, transportation, bathing, and grooming, reach out to Home Care Assistance, an in-home care provider Harrisburg, PA, families can trust. 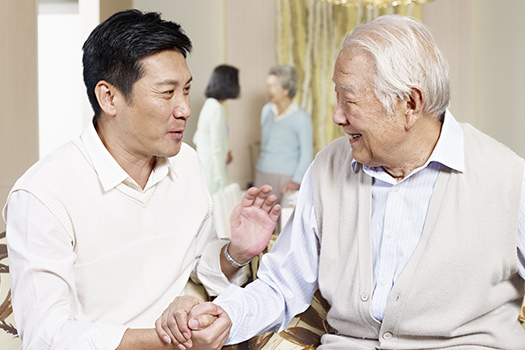 We also offer comprehensive care for seniors with dementia, Alzheimer’s, and Parkinson’s. Tech-savvy fathers might enjoy learning about online video chat services such as Skype so they can stay in touch with friends and family regardless of the distance. They might also appreciate the latest security software. Consider giving your father a new cordless phone with a caller ID. This way, he can scan the numbers and only answer calls from recognized numbers. Mobile phones are a great alternative, as they are less likely to attract telemarketing or scam calls. If you notice your father talks louder than usual or tends to turn up the volume on the radio or TV, he may need his hearing evaluated. Offer to make a doctor’s appointment and accompany him. Sometimes the problem is nothing more than an abundance of wax. However, the situation may also mean he needs a hearing aid. Nothing can replace the time you spend with your elderly loved one. If possible, visit your dad on Father’s Day to share a cup of coffee and conversation. Enjoy a meal or outing together or help around the home. Regular socialization can boost your loved one’s mental and emotional wellbeing. Managing medications can be challenging, especially when older adults take a variety of pills for multiple health disorders. Give your father peace of mind and help him maintain his independence by investing in medication organizers. These inexpensive devices come in different sizes and styles. Set up the organizer according to your dad’s medication requirements and pair the device with a programmable alarm clock to remind your father when to take the pills. Consider preparing your father’s favorite dishes and freezing them in single-sized portions. This way, he’ll only have to warm the meal in a microwave. Another option might include subscribing your dad to a delivery food service like a fruit of the month club. If your aging parent has a serious health condition and needs extensive 24-hour care, consider hiring a professional caregiver. Certain age-related conditions can make it more challenging for seniors to age in place safely and comfortably, but Harrisburg live-in care experts are available around the clock to help seniors manage their health. Whether your loved one is living with dementia or is recovering from a stroke, you can trust in professional live-in caregivers to enhance his or her quality of life. Call Home Care Assistance at (717) 540-4663 and hire a professional caregiver for your loved one without having to sign any long-term contracts.